Observer Members - The IICCI will appoint Observer Members amongst Hon'ble Minister, H.E. Governor, H.E. Ambassador, H.E. Consulate General H.E. UN Officials, H.E. AMERICA Officials / Agencies, H.E. EU Officials, H.E. AU Officials, H.E. 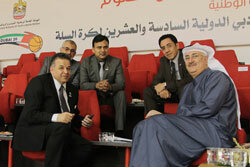 OIC Officials H.E. ASEAN Officials / Agencies, H.E. SAARC Agencies etc., H.E. BRICS and other Regional Governments, Top Corporates Sector from each country of OIC Nations & Other World.